One of the oldest nameplates in the passenger car portfolio from Nissan in UAE, the Sentra has been serving well for the brand in the executive sedan segment. The Sentra is one smart looking car, however, the overall design has remained now for a long time in existence, thus making it a bit dated in appeal. The Sentra is being offered with two engine options, both of which are petrol powered. While the smaller 1.6-litre petrol generates 115PS of power and 154Nm of torque, the bigger 1.8-litre engine produces 132PS of power and 174Nm of torque. The 1.6-litre petrol engine comes with both 5-speed manual as well as CVT gearbox, while the 1.8-litre petrol is offered with only a CVT gearbox. Both the engine options are available in three different variants – S, SV and SL. Color options for the Nissan Sentra are Solid White, Pearl White, Brilliant Silver, Phantom Grey, Black, Cayenne Red, and Brownish Grey. 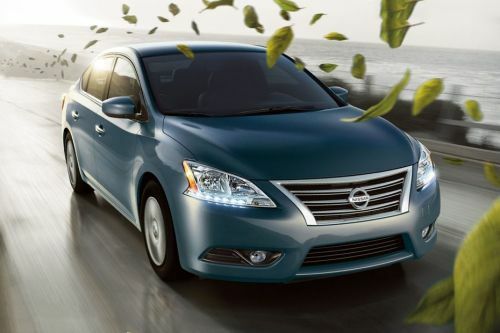 Have a question on Sentra? Sentra is available in 1 different colors - Super Black. Watch latest video reviews of Nissan Sentra to know about its interiors, exteriors, performance, mileage and more. Nissan Sentra is a mid-sized compact sedan, which is mainly popular in UAE because of being a feature-loaded offering within an affordable price range. It has been under production since 1982, but after the 2013 update, it has been sold as the rebadged version of the Nissan Sylphy. The Sentra has been a very familiar car in many parts of the world. The impressive sales number of the car in the UAE market has urged the manufacturer to come up with minor updates from time to time in order to keep up the freshness of the car. The 2018 Nissan Sentra flaunts more of a contemporary look with subtle design tweaks. The design is somewhat aerodynamic, which reduces the air friction and improves fuel efficiency. Loaded with NissanConnect, it stands true to the company’s claim of being a modern sedan. The Sentra sedan brings to you one of the best cabins from the house of Nissan, which is not only spacious but also equips a wide range of features to provide comfort and convenience that tends to offer you a great riding experience. The whole interior of the car is finished with soft-touch materials along with leather-wrapped seats that together offer a delightful cabin. The seats are comfortable enough to allow five adults to sit quite comfortably, as the legroom and knee-room are quite praiseworthy for the car. More to these, the car gets a spacious boot space with a capacity of 510 liters. The NissanConnect system adds to the convenience of the driver, as it brings almost everything at your fingertip, from social media to handling various apps and from streaming audio to Google navigation. To operate it, there is a touchscreen infotainment system equipped on the dashboard, which can seamlessly connect to your smartphone as well. The steering wheel of the car is mounted with the cruise control buttons that aids to keep track of the road. The additional convenience features include the start/stop button, intelligent key and a smart rear viewing mirror that automatically tilts to offer an enhanced viewing experience. The 2018 Nissan Sentra is a classy looking compact sedan, which gets minimal changes in styling over the 2013 model. However, the changes are decent enough to add some extra perks. It offers a sculpted body with graceful lines and attractive curves. Dimensionally, the four-door sedan manages to retain its body structure and muscular stance. It is 4,615 mm long, 1,760 mm wide, 1,495 mm tall and the wheelbase of the car is 2,700 mm. The refined design of the new Sentra is slightly aerodynamic, which improves the fuel-efficiency of the car. At the front, it gets the brighter and clear Xenon headlamps, unlike the traditional bulb headlamps that are outdated now and bring dullness to the design. The Xenon headlamps enhance the visibility, thus offering a safer riding experience during the night. It also flaunts daytime running LEDs that add to the mature styling of the car. No surprises, that the tail-lights are LED too. The Nissan Sentra is available in three different variants, namely Sentra 1.6 S, Sentra 1.6 S+AW and Sentra 1.8 S+AW. The first two variants feature a 1.6-litre petrol engine with a manual transmission option. Whereas, the top-notch variant gets the 1.8-litre petrol unit that comes paired with the XTRONIC CVT gearbox. The option of CVT in the top-notch trim aids to smooth change of gear with minimal changes in input throttle, thereby, eliminating the need for gear hunting. The first two variants, 1.6 S and 1.6 S+AW, are powered by the 1598cc, four-cylinder DOHC, twin CVTC engine that produces a maximum power of 113 bhp and a peak torque of 154 Nm, while the top-end trim, Sentra 1.8 S+AW is driven by a 1798cc, four-cylinder DOHC engine, which manages to develop the highest power of 130 bhp and a peak torque of 174 Nm. In terms of mileage, the 1.6-litre unit and 1.8-litre unit consumes 6.1-litre and 6.9-litre of fuel for every 100 km respectively. The lightweight engine, aerodynamic design and the introduction of Eco pedal indicator optimize the performance to deliver a high fuel efficiency. Nissan has used its new safety shield philosophy to provide the Sentra with all the essential safety kits, which not only protects you during any sort of mishap but also guides you through your way smoothly. Safety of the occupants has been taken seriously by the manufacturer, as it has provided six airbags for the safety of driver as well as passengers during any type of secondary collision to provide cushioning from all sides. It also packs ISOFIX, which acts as the child seat anchors to keep your kids fully safe during the drive, right from the low-end variant. Besides the disc brakes on the wheels, the braking system of the car offers anti-lock braking system (ABS) that helps to control the braking of the car quite effectively in tough situations. More to it, the car also packs Electronic Brake Force Distribution (EBD) that sends the extra braking force to the rear wheels when there is a requirement by sensing it automatically. The car packs the features like anti-theft alarm and rear parking camera for additional safety. It also gets a Vehicle Dynamic Control (VDC) that aids to drive the car in your intended path. What are the colors options available in Nissan Sentra?